The call for proposals for sessions at the 2019 EULETA Workshop is open. The European Legal English Teachers’ Association (EULETA) unites Legal English teachers from Europe and beyond to promote effective teaching, networking, and the sharing of experience and information. We accommodate teachers from both academia and business, and provide a link between practitioners from different backgrounds. One of our main activities is the organization of conferences and workshops. 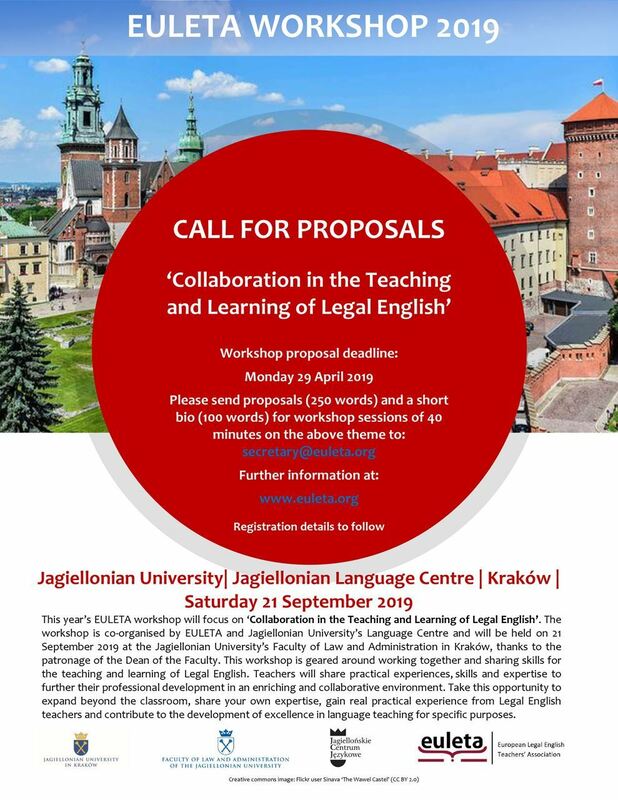 Experts in the field of Legal English meet once a year over a weekend to run presentations, seminars, and workshops on methodology, materials development, and other key areas of Legal English teaching. We hold one major event every year. In recent years, our events have taken place in Germany, the Netherlands, the United Kingdom. and Croatia. We also provide information on materials, publications, and online resources, maintain a trainer directory and a network of country representatives. For members, we offer a range of benefits, including free teaching materials, training programs, and reduced conference fees.